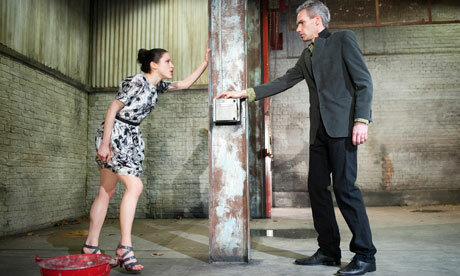 I went to the Young Vic with no pre-conceptions about what I was about to see. I knew nothing about Fosse, and only knew the work of Patrice Chereau through one of his films. I was drawn to the show months ago by the story, and to see another of Simon Stephens work, even if it was an adaptation. Because of this, I had no idea what was in store for me. I have deliberately waited a week to allow myself time to absorb the script and the story, and while I left the theatre unsure of if I enjoyed the show of not, I now know I was witnessing something incredibly special. I Am the Wind’s story is simply that of two men in a boat. The One is a sailor, and appears to spend a long time alone at sea. The Other seems to know very little about the sea, but takes on an almost protective role throughout their time together. The One sways between calm and depression in rather the same way the boat rocks them, before a journey takes them too far out to sea, and The One goes overboard (stumbles or jumps?). Behind this simple story are layers and layers of emotion and meaning, and even after reading the script twice now, I still know there is more to discover. The reading I get so far is that this is an absurdist study of two people, both dependent on the other for different reasons, struggling to find their place in the world and contemplating the point, or rather pointlessness of their own existence. Depression also seems to be an incredibly important aspect to this production. The One is certainly consumed by his depression. He can’t be alone, but he can’t be with people. He both loves and hates the boat, and fears the moment when he will just step over the edge and into the sea. I thought at one point that these characters were one of the same personality, one sinking into apathy and depression, the other trying to remain buoyant despite his situation, however in retrospect I don’t believe this is the case. The fact there are so many ways to interpret this production has to be a good thing. Chereau’s production is stationary and beautiful, and Richard Peduzzi’s set is nothing short of mind-blowing. A pool lies dormant and still in the centre, rippling only when one of the men step briefly around it’s edges. It’s simplicity was striking, and I thought I could not be more impressed, until a raft rose from the water, tipping, tilting and rising as though on a gentle sea. The raft certainly provided a physical challenge for the actors, and both took on that challenge with aplomb. 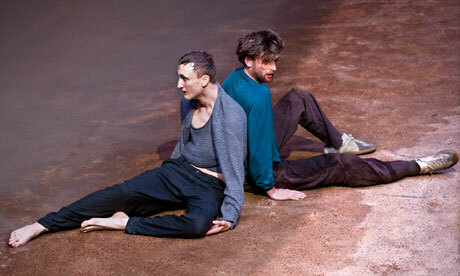 Tom Brooke as The One is compelling, his whole being seeming to represent the sea he sits on. Quiet on the surface, with so much turmoil beneath. Jack Laskey, in a way, has a more difficult job – providing a crutch for the contradictory nature of his companion. However, his silent reassurance is a constant, and makes the relationship between the two characters that much more intriguing. It would be very easy to put Fosse’s script somewhere between Ibsen, Beckett and Pinter, but there is a lot more to it than that. From the moment The One walks, or rather staggers onto the stage, we are treated to a prolonged and silent scene, wherein one man holds the other, first carrying him gently, then dressing him, physically supporting him throughout. 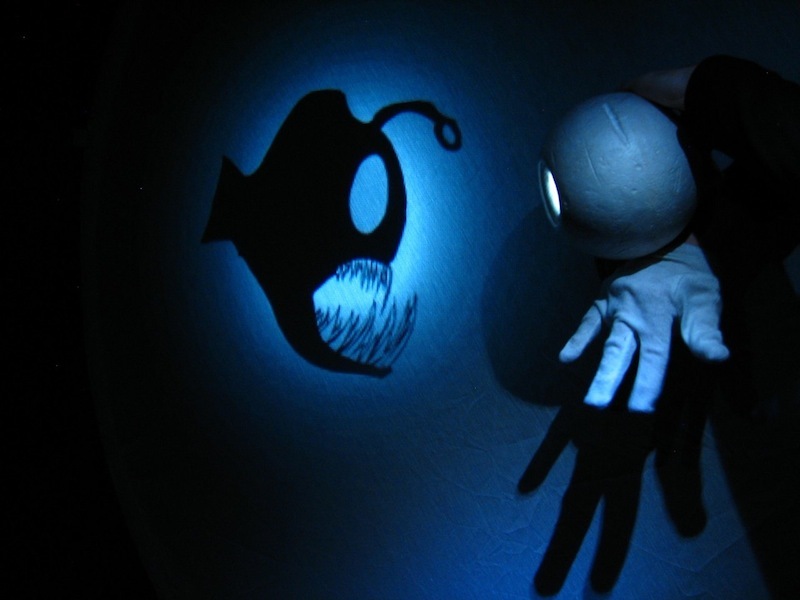 It is hypnotic to watch, and sets the tone for the duration of the production. This production should be essential viewing for any theatre fan. It is thought-provoking and haunting, and asks questions of its audience that will have you thinking long after you’ve left the theatre. The desire to simply live is not one any of us should take for granted, and Fosse’s script reminds us of this. Just wonderful.